Was Portsmouth's day of reckoning first of many? On a freezing cold day in London, standing out the front of the Royal Courts of Justice, it wasn’t the nip in the air that bit hardest but the reality of football’s financial problems. 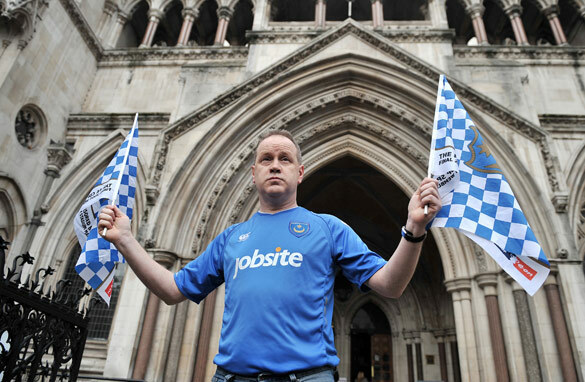 A lone Portsmouth fan stands outside the London High Court waiting for news on his beloved club. Aside from some harsh facts being laid bare over Portsmouth’s sorry financial state, and their battle for survival, there were two other football clubs in court on Wednesday in a similar position on the Companies Court Winding Up List. English second-division side Cardiff City and another club from a lower league, Southend United, faced lawyers from Britain's tax-collecting body who are chasing millions of dollars in owed money. All clubs had their hearings adjourned or delayed. It must surely raise alarm bells across Europe and indeed the world, that hearings in court on Wednesday for three clubs across three leagues could signal the start of a greater financial crisis in soccer. The collective debt of English Premier League clubs amounts to some $5 billion - despite the fact it is arguably the most lucrative and successful in the world. On a Europe-wide scale the mountain of debt racked up by clubs employing a free-spending policy in the transfer market must surely be astronomical. Already this year we have seen Dutch side Haarlem go bust with $2.75 million worth of debt and there have been others in Portugal and Russia. Refinancing debt in the past used to be pretty easy for football clubs but since the global recession, money is much harder to find, especially with banks tightening their purse strings. And finding suitable buyers with pockets deep enough to cope with paying outstanding debts and then investing in buying more players must be harder after the global economic problems. Living off debt was a major factor in causing the global recession and surely the same must apply to football. There is good reason to think the days spent standing at the front of a courthouses for sport reporters across Europe could become more regular as football’s financial crisis continues to bite.